Look! 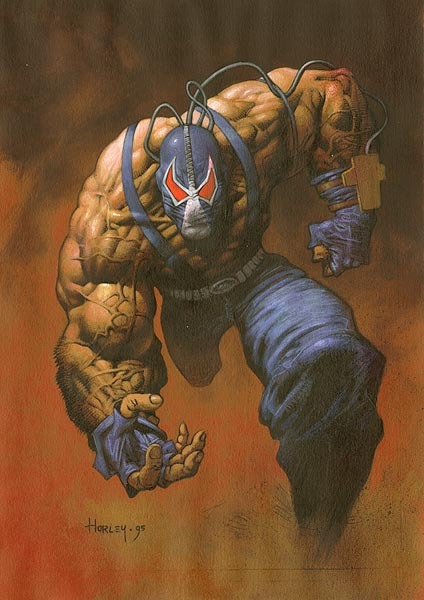 It's Tom Hardy as Bane in "Dark Knight Rises"
When the press release announcing the beginning of principal photography on the next Batman movie was released, we found the prospect of talking about it just a little depressing--"Hey, those people we said were gonna do something? They're doing it." But a sneak peek at Tom Hardy as the Caped Crusader's next onscreen nemesis? That's a different story. The image comes by way of TheDarkKnightRises.com/image, where it's being filled in pixel by pixel with each tweet if the hashtag #thefirerises. But lucky for us, some clever monkeys figured out how to pull the whole image out of the sight. Hardy looks appropriately huge, which, if you saw him in "Bronson," you knew he would. And the mask is a nice Gimp-like twist on the classic version, allowing Hardy to do some acting out from under. BURBANK, CA, May 19, 2011 – Principal photography has begun on Warner Bros. Pictures’ and Legendary Pictures’ “The Dark Knight Rises,” the epic conclusion to filmmaker Christopher Nolan’s Batman trilogy. Leading an all-star international cast, Oscar® winner Christian Bale (“The Fighter”) again plays the dual role of Bruce Wayne/Batman. The film also stars Anne Hathaway, as Selina Kyle; Tom Hardy, as Bane; Oscar® winner Marion Cotillard (“La Vie en Rose”), as Miranda Tate; and Joseph Gordon-Levitt, as John Blake. Returning to the main cast, Oscar® winner Michael Caine (“The Cider House Rules”) plays Alfred; Gary Oldman is Commissioner Gordon; and Oscar® winner Morgan Freeman (“Million Dollar Baby”) reprises the role of Lucius Fox. In helming “The Dark Knight Rises,” Christopher Nolan is utilizing IMAX® cameras even more extensively than he did on “The Dark Knight,” which had marked the first time ever that a major feature film was partially shot with IMAX® cameras. The results were so spectacular that the director wanted to expand the use of the large-format cameras for this film. The screenplay for “The Dark Knight Rises” is written by Christopher Nolan and Jonathan Nolan, story by Christopher Nolan & David S. Goyer. The film is being produced by Emma Thomas, Christopher Nolan and Charles Roven, who previously teamed on “Batman Begins” and the record-breaking blockbuster “The Dark Knight.” The executive producers are Benjamin Melniker, Michael E. Uslan, Kevin De La Noy and Thomas Tull, with Jordan Goldberg serving as co-producer. “The Dark Knight” is based upon characters appearing in comic books published by DC Comics. Batman was created by Bob Kane. Behind the scenes, “The Dark Knight Rises” reunites the director with several of his longtime collaborators, all of whom worked together on the “The Dark Knight.” The creative team includes director of photography Wally Pfister, who recently won an Oscar® for his work on Nolan’s “Inception”; production designer Nathan Crowley; editor Lee Smith; and Oscar®-winning costume designer Lindy Hemming (“Topsy-Turvy”). In addition, Paul Franklin and Chris Corbould, who both won Oscars® for the effects in “Inception,” will supervise the visual and special effects, respectively. The music will be composed by Oscar® winner Hans Zimmer (“The Lion King”). The locations for “The Dark Knight Rises” span three continents and include the American cities of Pittsburgh, New York and Los Angeles, as well as sites in India, England and Scotland. “The Dark Knight Rises” is a presentation of Warner Bros. Pictures, in association with Legendary Pictures. Slated for release on July 20, 2012, the film will be distributed worldwide by Warner Bros. Pictures, a Warner Bros. Entertainment Company.